Unfortunately due to the length of our waiting list for Autism Support Dogs, applications are not being accepted. Please visit this page for updates. 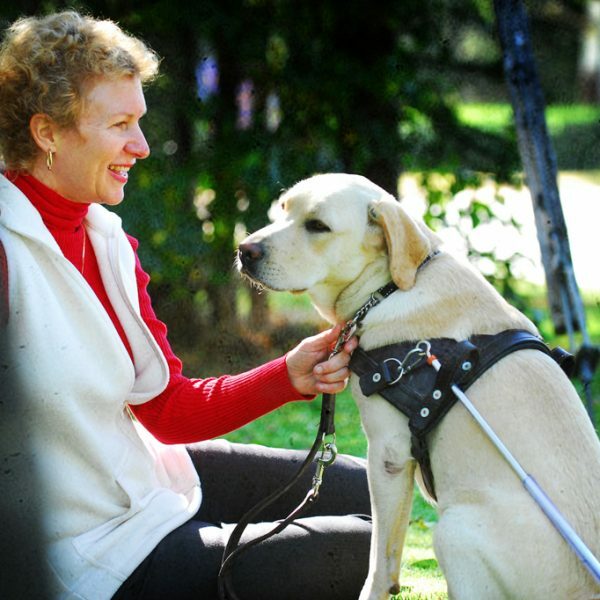 The College of Orientation and Mobility is one of four departments of S A Guide-Dogs Association for the Blind (GDA). 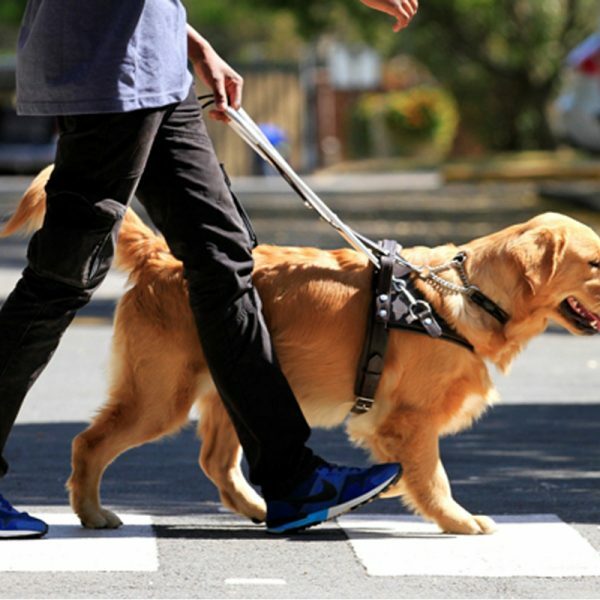 It was established in 1974 to provide people with visual impairments with an alternative to a Guide Dog, namely white cane (also known as long cane). The white cane is an extremely useful mobility aid that can become an extension of a person’s sense of touch. Freedom and independence mean different things to different people. To a person who is visually impaired it may mean the ability to go to the bank, visit friends, go shopping unaided or travel to work safely on a daily basis. This means the need to be able to know where they are and to move around safely. These skills are called Orientation and Mobility. Training Orientation and Mobility Practitioners who teach people with visual impairment cane skills and skills of daily living. Provide visual impairment awareness training to a range of audiences. Orientation & Mobility Direct Services – our Orientation and Mobility Practitioners provide training to children and adults with visual impairment, at no cost to them. The College of Orientation and Mobility presents a two year, NQF level 5, ETDP Seta accredited Diploma in Orientation and Mobility Practice. This qualification includes theoretical and practical components. Students learn how to teach the use of the white cane and teach skills of daily living, for example cooking, cleaning and identifying money. Much of the training takes place while under blindfold and includes a wide variety of training situations. Other modules include advocacy, counselling, medical conditions of the eye and child development. Lectures take place at the College and practical experience involves teaching people with visual impairments within the community. This is a scarce skill as there are only approximately 40 to 50 qualified O & M Practitioners employed throughout the country. It is estimated that in South Africa, there are approximately 388 000 individuals who are blind, and approximately 1 300 000 individuals who are partially sighted (formulas taken from the 2010 WHO statistics). One qualified Orientation and Mobility Practitioner can train between 40 to 45 people who are visually impaired, per year. The majority of the trainee practitioners at the College are previously unemployed, black and from disadvantaged communities. Some of our students are sponsored by their employers to receive this training, others are sponsored by S A Guide-Dogs Association. Any donation that you make will go directly to supporting an individual learner on a diploma course. Donations will cover the cost of their tuition, accommodation, subsistence stipend, travel and training materials. The College also provides workshops and short course training on a variety of visual impairment and Orientation and Mobility related topics. Our clients include the nursing and teaching professions, care-givers, the hotel industry, banks, as well as employers and colleagues of people with visual impairment. With a team of highly competent facilitators we are able to present tailor made training at your venue. Our venue is also available for training purposes. As our area of expertise is visual impairment, our awareness workshops enable others to gain insight into the world of the differently-abled. We employ Orientation and Mobility Practitioners who provide direct services to people who are visually impaired. The aim of any training is to give the person a greater level of independence in their daily lives. Any person who is blind or partially sighted, is eligible for this free service. We cover the Pretoria and greater Johannesburg areas. The services include teaching people who are visually impaired any home or personal management skill such as ironing, cleaning, money identification, pouring hot and cold drinks, cutting and peeling vegetables and cooking. Orientation and Mobility skills include teaching sighted guide skills, room orientation, cane skills and routes. An Orientation and Mobility Practitioner is able to give the family members of people with visual impairment many practical tips that they can use to assist their loved one. Our practitioners provide these services in the person’s home after a comprehensive evaluation of their requirements has been undertaken. Our practitioners are also trained to work with children and can offer advice to parents and care givers. Any donations towards the provision of assistive devices for our clients would be greatly appreciated. Liquid level indicators, money sticks and white canes are all commonly used assistive devices. Autism Support Dog applicants should be between the ages of 5 and 12 years old. Guide Dog applicants should be 18 years or older (applicants in their late teens will be considered). Service Dog applicants should be 13 years or older. The role of the working dog. The advantages and disadvantages of owning a working dog. The responsibilities of dog ownership. The training process of the dog and owner. A working dog may not be recommended for each applicant. If you do not enjoy being near dogs then a working dog will not be the solution for you. For information regarding working dog applications please complete the enquiry form below. Applicants who are accepted for training will be expected to pay R205 for their trained working dog. This nominal payment means that a working dog is within reach of any person who is able to afford to care for a dog on a monthly basis. Working dog owners agree to care for the dog in a humane manner and to follow GDA’s guidelines with regards to the ongoing training of the dog. GDA is always available for advice and assistance. Each working dog owner will undergo training so that they are able to care for their dog and work the dog in a safe and efficient manner. Working dog owners are taught how to understand their dog’s needs and how to continue the training of the dog utilising the principles of positive reinforcement. Most working dogs owners undergo training at one of GDA’s Training Centres, in Johannesburg or Cape Town and in their home environment. All working partnerships are eligible to receive ongoing support and advice for the working life of the dog. Instructors are available to give telephonic advice and follow up visits as needed. All partnerships are visited on an annual basis. The owner is responsible for the upkeep of the dog but GDA can be approached for assistance if the dog requires any extended or expensive veterinary treatment. The success of the partnership is dependent on the owner and dog being compatible. Compatibility will depend on many different factors. A working dog that suits a young active student at university will probably not be a suitable match for a retired person. The instructor will consider everything that they know about the temperament and working ability of the dog. The next step will be to compare this to the needs, lifestyle, preferences and environment of the prospective owner. What Happens When the Working Dog Retires? Most working dogs will retire at about 10 years of age. Generally, the owner will keep the dog as a pet as they have such a strong bond with the dog. If the owner can’t keep the working dog then they are allowed to re-home the dog with a trusted friend or family member. If the owner does not know someone suitable then GDA will re-home the dog to an approved home. Retired working dogs are used to a lot of companionship and are usually re-homed with someone who does not work or who works from home. 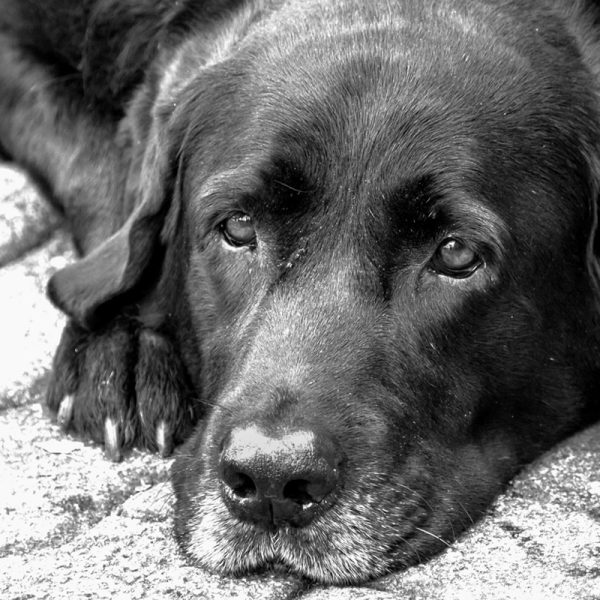 A retired dog will cost more to maintain as they may have additional health conditions due to age. Autism Support Dogs are specially selected dogs that are trained to work with children with Autism. The Autism Support dog’s primary role is to help with the tendency of children with autism to bolt or run off when distracted. Companionship for children who are often lonely due to their Autism. Assisting with speech therapy, general lessons and tactile issues. Provides physical pressure needed in times of anxiety. A Guide Dog and their owner work together as a team. The owner will be directing the dog on their given route. The Guide Dog will walk in a straight line avoiding all obstacles. At each landmark on the route the owner will give the dog the next instruction. At a road crossing the owner will decide if they want to cross the road or turn left or right. If the owner decided to cross the road they will give the dog the instruction to cross (once the owner has determined that it is safe to do so). The dog will cross straight and locate the upkerb. Dogs are very good at finding orientation points. These could be general orientation points that the dog will find in all environments (find the kerb, find the escalator etc.) or they could be specific orientation points that relate to that specific route (find John’s office). Guide Dogs begin their formal training when they are 12 to 18 months old. It is important that the dog and instructor have a strong bond. The instructor should understand each dog and treat them as an individual. Obedience (sit, down, stand, stay and recall). Guiding position (walking ahead and parallel to the handler). Straight line concept (the dog follows the natural curve of the path, avoids obstacles and returns to the original direction of travel). How to avoid obstacles (this includes height obstacles). Turns (the dog is taught to turn left, right and back). To indicate steps up or down. To “find” orientation points (find the kerb, find the step, find the escalator, find the door, find the crossing). To use lifts and escalators. To work safely in non-pavement conditions. Traffic work exercises to increase the dog’s awareness of vehicles. To behave in an acceptable manner in all social situations. In the final stages of their training all Guide Dogs are trained while the instructor is wearing a blindfold. 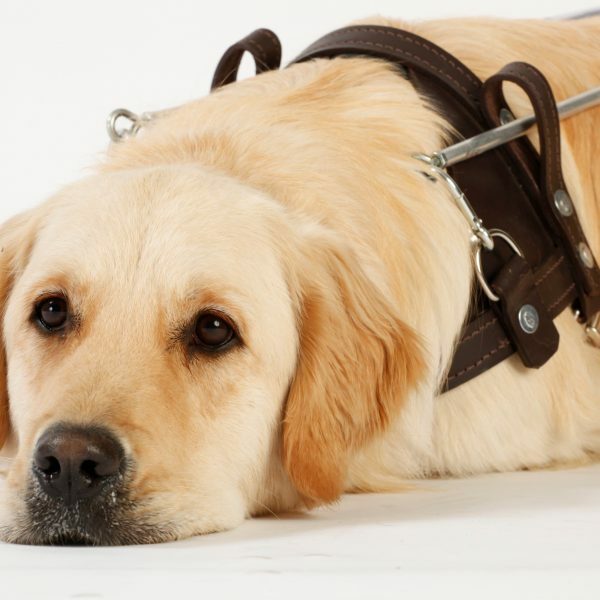 Guide Dogs are able to demonstrate their guiding ability in different environments and situations. The Service Dog is trained to meet the needs of their owner. Each Service Dog owner would have a different lifestyle and would require the Service Dog to assist with their specific needs. In the final stages of the dog’s training the instructor would practice tasks that are very similar to the tasks that the dog will perform when it is working with it’s owner. If you use a wheelchair it can be impossible to reach items that have been dropped on the floor or items that are placed on a high table. Service Dogs can accomplish these tasks with ease. Door handles need to be adapted to make it possible for the dog to assist with pulling down the lever. The instructor will advise on all of the specific adaptions that will be required. 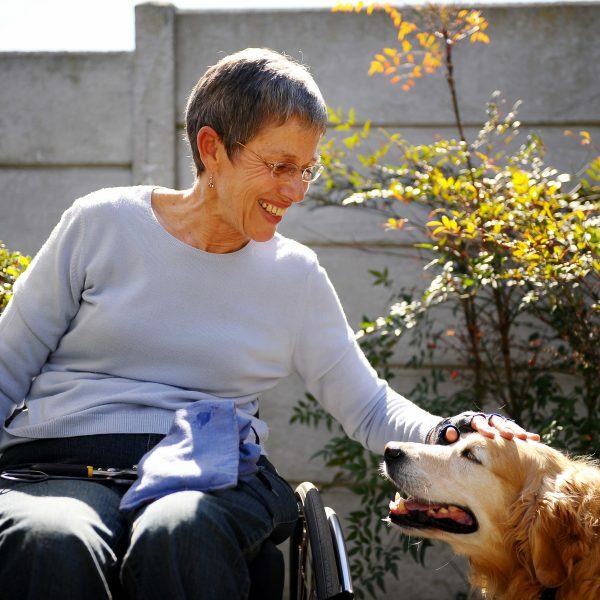 Service Dogs assist people who are physically disabled. They are taught the main tasks of retrieve, push and pull. These tasks are initially taught in their most basic form but as the dog progresses the tasks become more complex. Retrieve a variety of items from a variety of locations. Assist with the opening and closing of doors, draws, cupboards etc. Assist with the switching on of light switches. Locate a family member on the property and indicate that their owner needs assistance. Take items to/fetch items from another person on the property. Walk next to the wheelchair in a controlled manner.